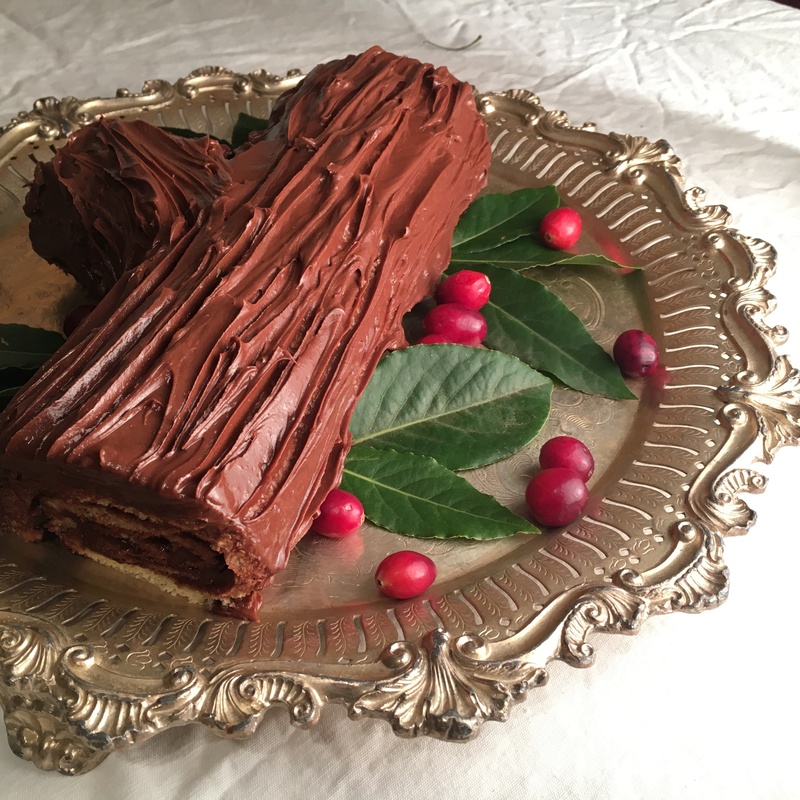 Bûche de Noël is a recent Christmas dessert for us, so not really a tradition yet, and only time will tell if it becomes one. I definitely intend on making it this year for our family dinner; we tried it last year for the first time, and my sister Cassie and I were surprised at how relatively easy and quick it was. And of course, everyone liked it, which is the most important part! The year before, I’d tried making a Black Forest Cake (I’ll probably post the recipe eventually, but I’m not like, enthusiastic about it), which was a lot of faff and not that great, in the end, so it was gratifying to make something that wasn’t too fussy and was good enough to (perhaps) supplant my mom’s usual request of an Apple Pie (though mine is never *quite* as good as Nana’s, in her estimation). 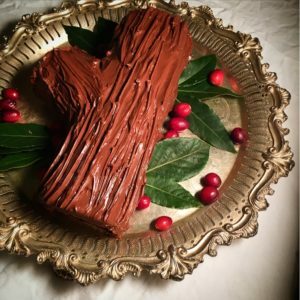 One of these days, I’m going to try making sweet little meringue mushrooms to decorate my Bûche de Noël – there’s a very detailed video showing you how to make them here – and you can go gangbusters with the icing and styling, making chocolate bark, adding in elements like greenery for moss, rosemary, berries. My personal rule is that everything on a plate ought to be edible, but y’know – you do you. Something I’ve been really enjoying this week, since I discovered it on Youtube, is this playlist with 8 hours of Kmart department store Christmas music from the 60s or early 70s. 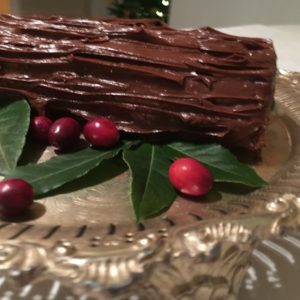 It’s a mish-mash of styles, and very lo-fi, but it’s kind of retro-festive, upbeat, and great to have on in the background when you’re doing other things, like baking or wrapping presents. It’s a nice change from my usual rotation of classic stuff, or from the much broader mix I hear at work every day during this time of year. Anything else pretty and edible – I’d love to see it with red currants, and lots of people use rosemary for greenery, or green tea powder to make the log look mossy. a large-ish baking sheet with a rim – mine is 18.5″ x 12″, but yours doesn’t have to be that big – just keep an eye on it as it bakes! Many bowls – like, so many bowls. At least 4 bowls, 5 if you don’t have time/space to wash up between making cake and making icing. 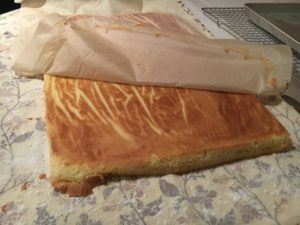 Cake: In a medium-sized mixing bowl, whisk together cake-and-pastry flour, baking powder and salt; set aside. In a heatproof bowl over a saucepan of simmering water, heat milk with butter until melted. Remove pan from heat, leaving bowl on top; cover to keep warm. Separate 3 of the eggs, dropping yolks and whites into separate large bowls. 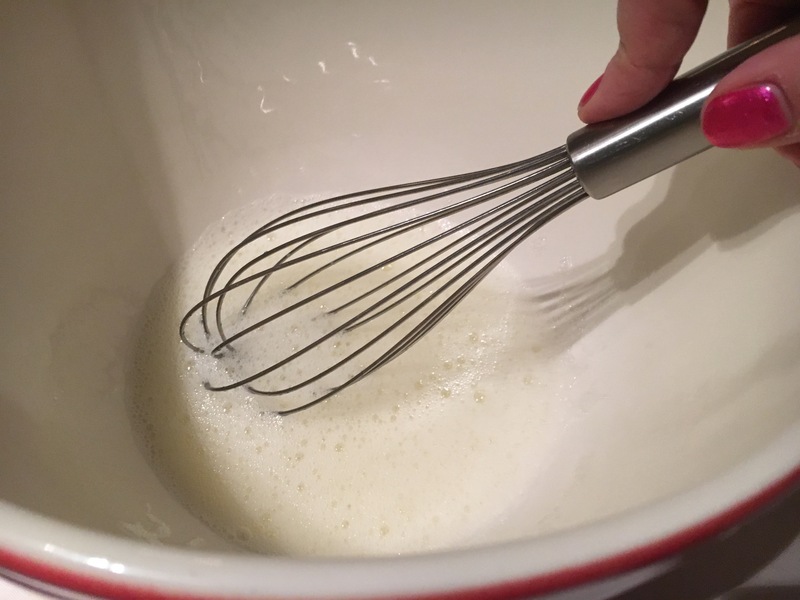 Beat egg whites until foamy; beat in 1/4 cup of the granulated sugar, about 1 tbsp at a time, until soft peaks form. Beat together egg yolks and remaining eggs and 1/2 cup granulated sugar until pale and thick enough that batter leaves ribbons on surface when beaters are lifted, about 5 minutes. Fold in one-third of the whites; fold in remaining whites. Do not mix entirely. Sift flour mixture over top; fold in until just combined. Pour in milk mixture; fold in until blended. do not over-mix. Spread in a 15- x 10-inch parchment paper–lined rimmed baking sheet. It’s okay if the corners aren’t perfect; icing covers a multitude of flaws. Bake in 350°F (180°C) oven until golden and cake springs back when lightly touched, 12-15 minutes. This is a great time to wash some bowls, so that you have one ready to make the icing. dust your clean tea towel with 1 teaspoon icing sugar. 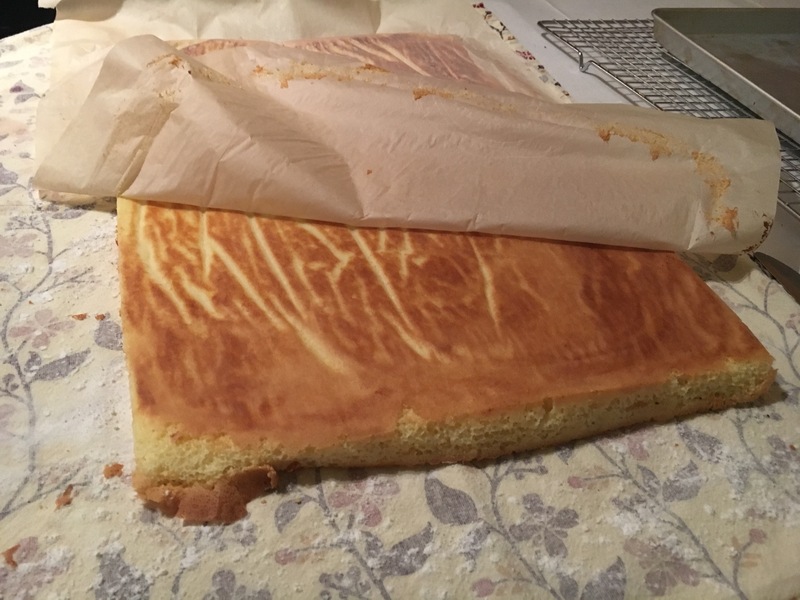 Loosen edges with knife; you’re really just using the knife to lift the crisp edges of the cake away from the paper. Invert onto icing-sugar-dusted tea towel. Before the cake cools, carefully peel off paper. 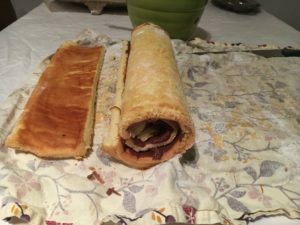 Working fairly quickly, and starting at a short side, gently roll up cake in a clean tea towel; let cool on rack. You can wrap in plastic wrap and store at room temperature for up to 24 hours. 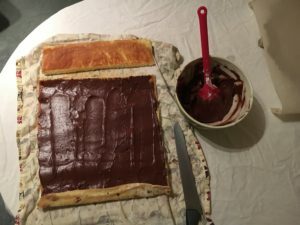 Icing: Melt chocolate and allow to cool. In bowl, beat butter until fluffy; gradually beat in whipping cream, then vanilla. Beat in icing sugar, 1 cup at a time. Beat in melted unsweetened chocolate until fluffy. 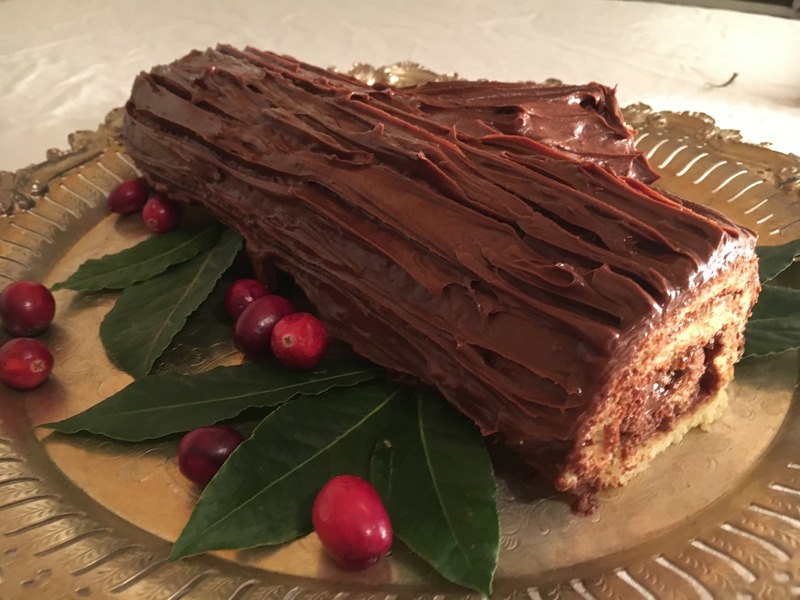 Unroll cake; if you’d like to make a branch, cut a 2″ strip off of the long side of the cake. Spread each piece with 1-1/2 cups of the icing. Reroll main log without towel; place, seam side down, on platter. Reroll side branch without towel; place seam side down and cut a 45 degree angle off of one end. Use icing to ‘glue’ the branch to the main log. 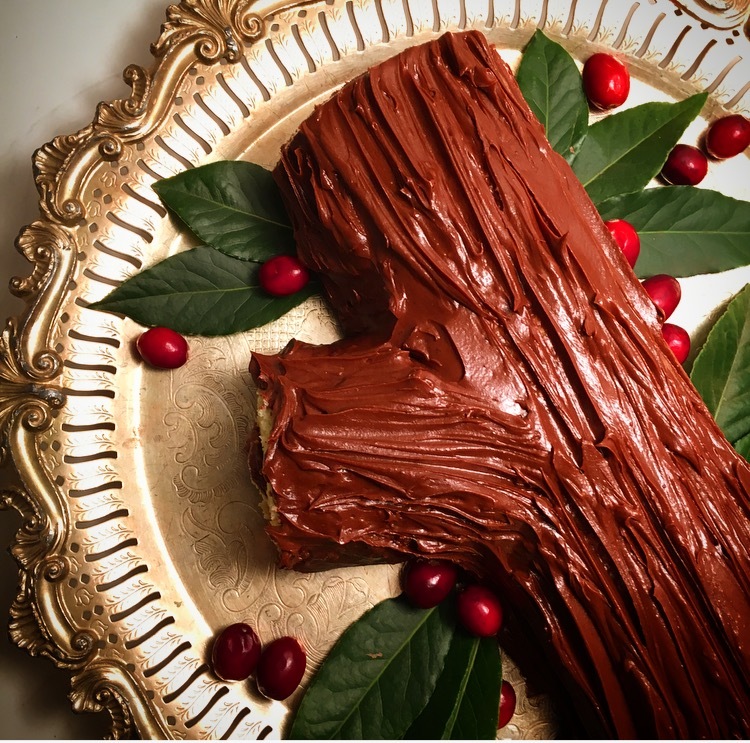 Spread remaining icing all over log. You have inspired me once again! 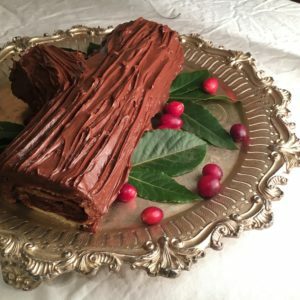 Making this for the first time for our Christmas dinner.